It might be a bit noisy, sometimes even intimidating. Little black cat Juju goes crazy when it starts whistling. But this is one of my favorites tools in the kitchen: A pressure cooker. From the everyday black beans to the occasional brisket, I use a ten year old Italian pressure cooker for virtually all soups, stews and complex casseroles. It reduces any cooking process by a third of the normal time on a common pot, and maintains all vitamins and minerals inside, and straight to our plate. Not to mention the low energy consumption. Throughout the years - I got one as a wedding gift from my mother in law-, I learned how not to to be scared by its music. Mine doesn't have the pressure clock and the rubber, like my grandmother's outdated one, and it is pretty safe. I read that the current models are very silent, and even more efficient than the one I have. This evolution is a ongoing process since 1679, when a creative French man created the first model of pressure cooker. One small piece of advice: to make sure it will work well and safely always read the manual. But some good old tips to facilitate its use: always let it stop releasing pressure before considering opening it, and if in a hurry, take its pressure under running water on a heat-proof kitchen sink. Heat olive oil. Add bacon or kielbasa (if chosen), garlic, bay leaves and let all fry for some minutes. Add black beans, stir and top with water, filling up to 3 inches up the beans. Cook on medium heat and when whistle begins lower heat for 30 minutes. 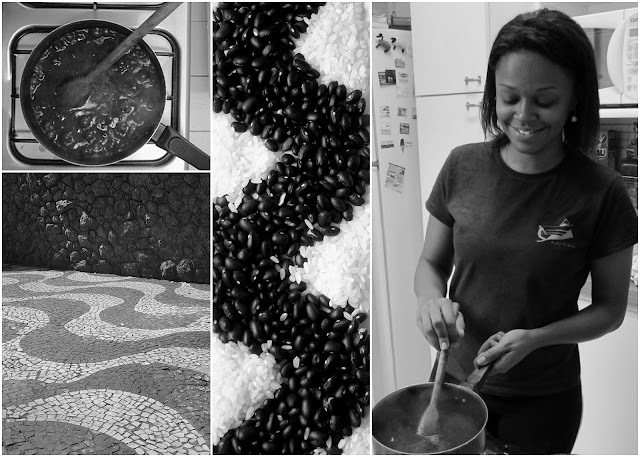 Enjoy the most simple everyday black beans Brazilian style over California white long rice. Anna convinced me to get one -- I got a less expensive Presto model, and it is noisier, but I love it. We generally use dry beans, and I get super fast, consistent results with the PC. I think it's edged out the crock pot in my lazy tool set: I don't have to plan ahead, and I don't have to leave something plugged in all day. When I was researching pressure cookers, I kept reading about Lorna Sass; I borrowed her PC cookbooks from the library. They're a great introduction, and I still have a lot to learn. The pressure cooker led me to rediscover simple, perfect pot roast. Yum. In India everyone uses pressure cookers and pressure pans. I have lugged two cookers and one pan over the years and use one of them almost everyday. Great for cooking baby food purees! Thanks for giving the Presure Cooker the place it deserves as a wonderful cooking aid. I especially enjoyed knowing that it dates from 1679, and that it was presented then to the British Royal Society - the forum for new inventions - by a Frenchman!